Marriage is a great lesson on give and take. I will admit, during my first year as a married woman I had a hard time taking and an even harder time giving. I was so independent it was difficult for me to open a joint bank account so we could easily pay the bills. If he asked me to turn off the lights when I left the house, I would huff and puff until the house fell down. Then, something clicked. I realized he was just asking me to give him what he needed to be comfortable and joyful. As soon as I learned how to give more than I wanted to receive, I got a lot more in return. I am only three years in to married life, but I have learned more about myself with him than if I were doing this alone. It is an evolution of love and commitment that keeps me grounded and at ease. I speak of marriage and giving because my audacious husband caught me a rockfish fresh from the Chesapeake Bay. Yes, he did. And when he brought it home fresh on ice, he expected me to help him filet it. I had to put my fear of fish eyes and guts behind me while we expertly fileted the 33 pound water beast with a little help from YouTube. And what did I get in return? 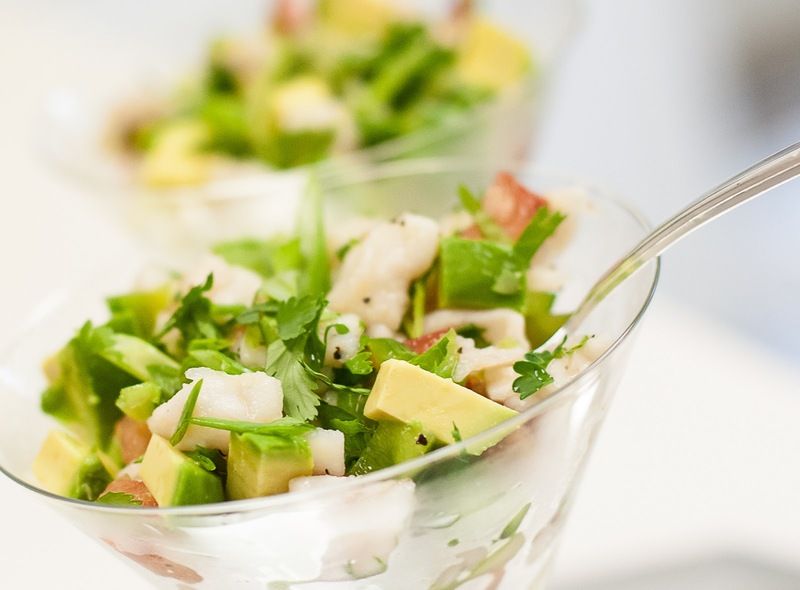 The chance to make a pleasing batch of succulent and fresh Rockfish Ceviche, and eat it with him. Ain’t love grand? In a large bowl, toss the fish, serranos, celery, and salt together. Cover in lime juice (the fish should be completely immersed in the lime juice). Cover and let the mixture sit in the refrigerator until the fish starts to “cook” and turn opaque; about two-three hours. Remove from the refrigerator and toss. Add tomato, green onion, parsley, diced avocado, black pepper, and half the cilantro. Lightly toss to mix without breaking avocado. Serve in chilled glasses topped with fresh olive oil and cilantro. Great with tortillas, tortilla chips, or water crackers for crunch. *Cooks note: In order for the colors to remain vibrant and fresh, leave the tender herbs and vegetables out of the marinating process until the last few minutes before serving. Also, use a slotted spoon to drain some of the liquids while serving. Pssst...ceviche juice is known as a hangover cure called "Tiger's Milk". I dare you! 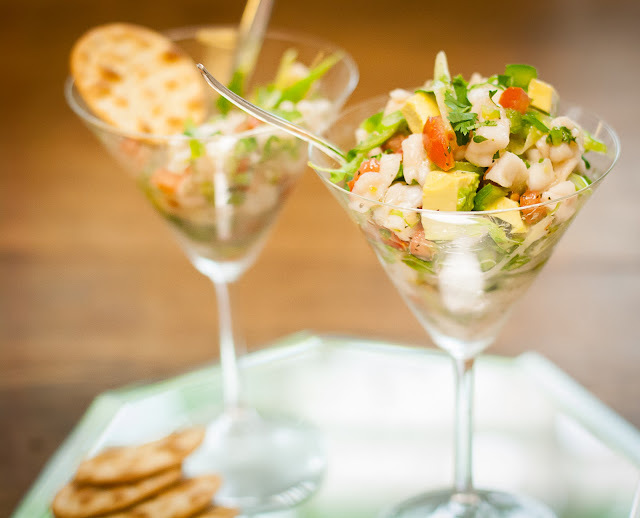 Love your Rockfish Ceviche served in martini glasses! First of all... you both rock for catching your own and cleaning a big boy fish like this. I would freak out...I don't have the guts to clean a fish. I'm a fish wimp so I like it all in fillets and pretty before I get near it. Now my mother... she's no joke.. she can clean a fish so I wish I got that fearless DNA from her. Now this civiche looks amazing... the pictures are outstanding. PS... you are so right about the give and take in marriage. I have learned to pick my battles... it's just not worth it to get upset over all the little things. Yes, ain't love grand. (Even though sometimes it takes a wet fish to make you realise it.) What a recipe you have - both here, in your photos of this lovely dish - and in your life. Congrats! I loved reading this. When that seachange of attitude shifts in a relationship and it becomes less about you its very liberating in a way that is hard to describe. Now if I could only get my man to deliver unto me a Rockfish now and then! I'm jealous.